Yesterday I was looking at pictures of beef and drooling. Woah, woah, woah! Before anyone freaks out, let me explain. I often find inspiration for my recipe from animal-product filled recipes. It’s not the meat that is making me drool, (that part is a real turn off for me). It’s the idea I have in my head about how I can achieve similar textures and flavours. The chew, the crispiness, the umami, the juiciness. All that deliciousness but made blissfully vegan. That’s what I am drooling over, my imagination. 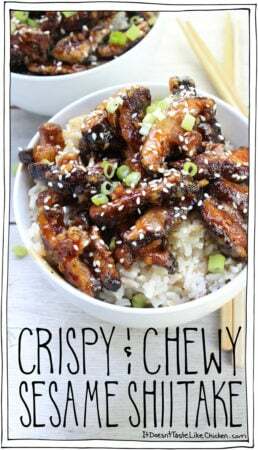 So when I stumbled upon a few recipes for sesame beef, my brain started mentally sorting through my kitchen and I thought of the bag of dried shiitake mushrooms that I use in my Quick Vegan Pho and my Congee recipe. Even after soaking for a long time and cooking, the dried shiitake remain super juicy and chewy. Light bulb! So I played around a bit, and BLAM-O! (Is blam-o a thing kids say now? I don’t think so). I tossed the mushrooms in cornstarch fried them up and stirred them into a quick sauce. Slightly crispy on the outside, super chewy and juicy on the inside, coated in a sticky sweet and spicy sauce. Gah! This hit all of the flavour points and textures I was striving for and hot dang it’s delicious.This just turned into one of my new favourite dishes that I will be whipping up on a regular basis. For some more veggie-ness, feel free to add in some sautéed broccoli, bok choy, spinach, or other greenage. 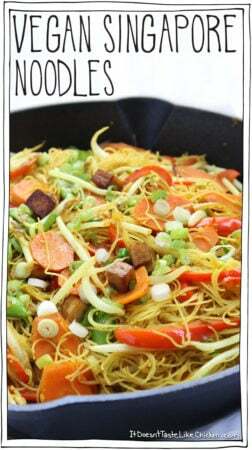 I served mine over rice, but I think rice noodles would also be fab. Enjoy! 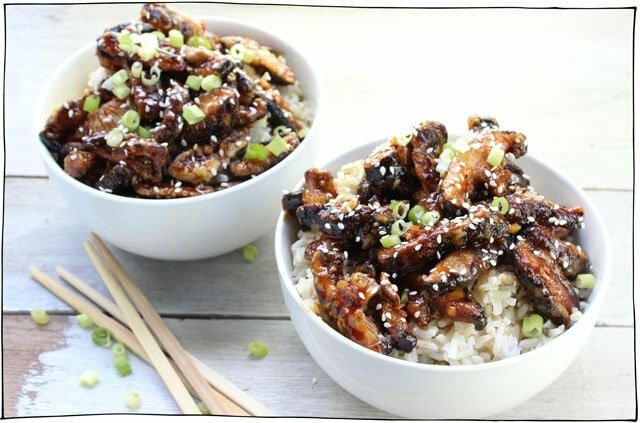 To make Crispy & Chewy Sesame Shiitake: you are going to need dried shiitake mushrooms. Fresh mushrooms won’t work the same way as they don’t have the same chewy texture as the dried ones. I found a big bag of dried shiitake at my local grocery store, but if your store doesn’t carry them, you can order them online. One bag lasts a long time! 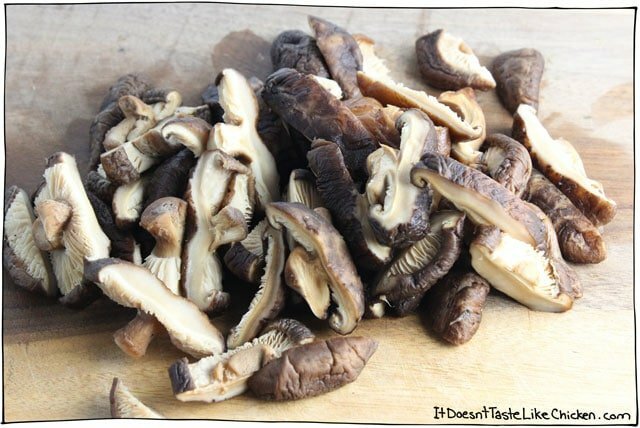 Rehydrate the mushrooms by covering them in boiling water. I always put a bowl on top to help push to mushrooms down and keep them submerged. Soak them for around 40 minutes until they are nice and tender. Drain the mushrooms. If you wish you can save the liquid to use as a mushroom broth. Now squeeze out the excess water from the mushrooms. Don’t mush them to death, but just lightly squeeze them and shake off the water so they are on the drier side. Cut them into nice thick slices, about 1/2 inch. Toss them in the cornstarch so they are evenly coated and shake off the excess. Heat oil in a skillet over medium-high heat. 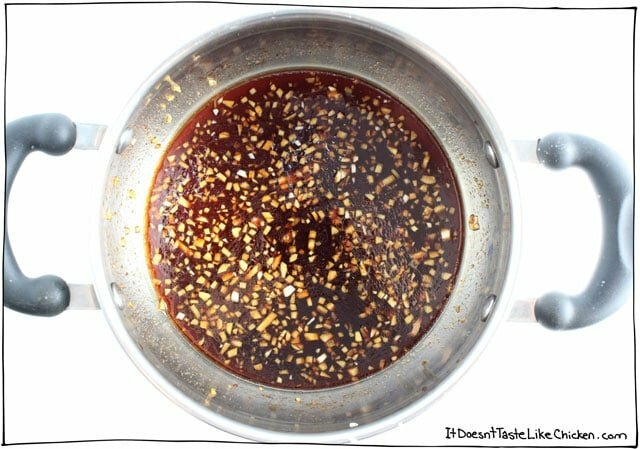 Make sure the oil is nice and hot before adding in the mushrooms so that they fry, and not just soak up the oil. 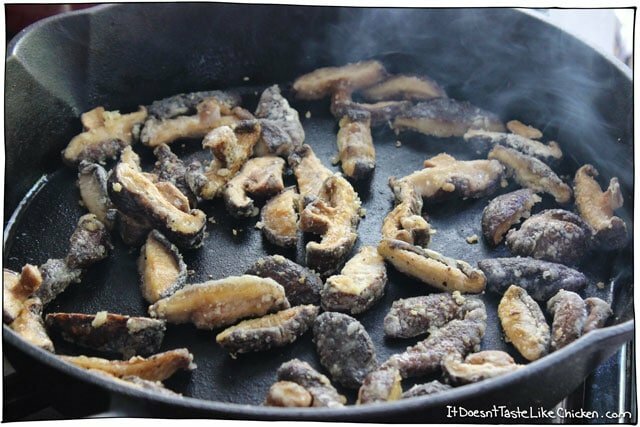 Fry the mushrooms until they are lightly golden on all sides, and no white cornstarch remains. In the meantime make the sauce by adding all of the ingredients to a small saucepan. Cook the sauce for about 2 minutes until it begins to thicken. Add in the fried shiitakes and toss to coat. Serve immediately over rice or in any way that you desire. Slightly crispy on the outside, super chewy and juicy on the inside, coated in a sticky sweet and spicy sauce. 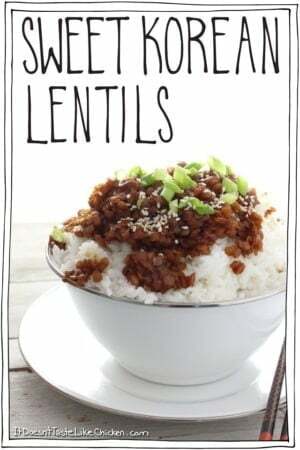 A vegan version of sesame beef. 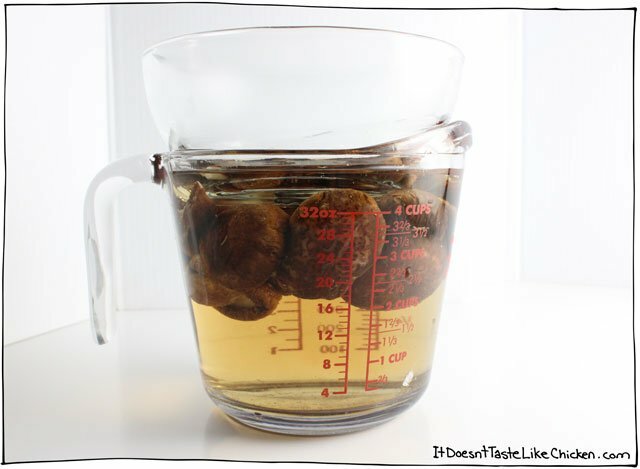 Cover the mushrooms in boiling water, and put something on top to keep them submerged. Soak for around 40 minutes until tender. Drain the mushrooms. If you wish you can save the liquid to use as a mushroom broth. Now squeeze out the excess water from the mushrooms. Don’t mush them to death, but just lightly squeeze them and shake off the water so they are on the drier side. Slice them into nice thick slices, about 1/2 inch. 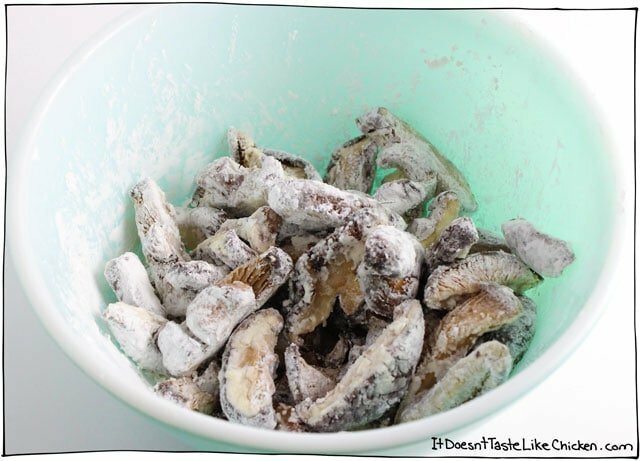 Toss them in the cornstarch so they are evenly coated and shake off the excess. In the meantime make the sauce by adding all of the ingredients to a small sauce pan. Cook the sauce for about 2 minutes until it begins to thicken. Add in the fried shiitakes and toss to coat. 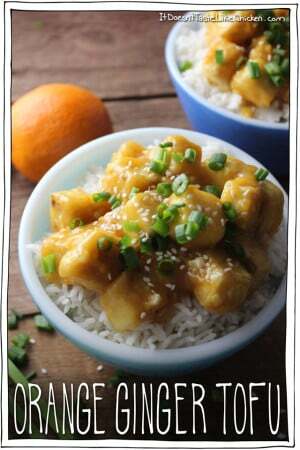 Serve immediately over rice or in anyway that you desire, and garnish with green onions and sesame seeds. Previous Post: « Introducing Chickpea – My New Pooch! I made these tonight and I love love love them. Besides soaking the mushrooms, this all came together in about 5 minutes. Will absolutely make this again. Thank you so much! Last week we bought some gorgeous flower-top shiitake mushrooms from Costco. We made these tonight to honor Chinese New Year. Easy, fast, and fabulous! No regrets on having spent so much on them! Yes, I know that SHIITAKES are mushrooms, you have, however, spelled it SHITTAKE in your title. lol. You might want to edit your title as it sounds like something decidedly not mushroom-like, lol. Otherwise, this recipe sounds delicious! I need to try it ASAP. Haha! Shiitakes are a kind of mushroom. These look so nice Sam. Do you know of any healthier substitutes for cornstarch? I’m not a big fan of using that. I believe arrowroot powder should work. I made this for my meat-eating in-laws today. It was a HIT. I think next time I’ll reduce the spiciness a tad. We had it over brown rice with edamame on the side. Holy freaking COW this is an amazing recipe. I did use coconut aminos and coconut sugar instead of brown sugar and I used arrowroot starch instead of cornstarch but holy cow was this to die for. I mean making it again tomorrow for lunch. Oh and with some charred broccoli this makes an AMAZING Meal. Just made this and it tasted awesome. Always looking for new vegan recipes. My hubby saw this recipe on your Facebook feed. OMG!!! That’s all I have to say! Actually, this was super easy and super yummy! Only problem was that I couldn’t have seconds since there were none. 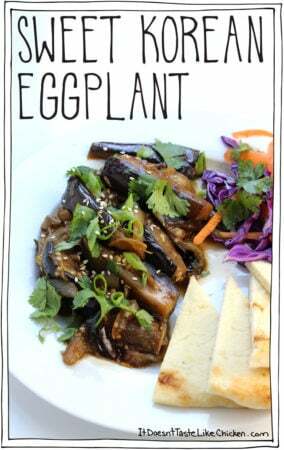 I could only find sliced dried shiitake… so actually ended up making this recipe even easier than stated. Thanks Sam! Yet another successful recipe. You make me a good cook! Now your husband is looking out for my recipes too! Haha. I will have the whole Srivani family following me soon. So happy you loved another of my recipes, Srivani! holy cow. this recipe was AMAZING. i’m still in awe with how freaking delicious it was. definitely going to try using shiitake mushrooms with other marinades, cause the texture was on point. thank you thank you thank you! Hi Sam!! I just moved to Auckland, New Zealand from Austin, Texas and moved in with my vegetarian Kiwi boyfriend. He doesn’t like spending time in the kitchen and is more than happy eating the same thing (he likes roasting piles of mixed veg) day after day. I’m the opposite in both things; I love spending time in the kitchen and I crave variety in my cooking and the things I eat. Although I’ve never been a huge carnivore I’m not a vegetarian or vegan, however I only cook us vegetarian stuff at home. It’s been a fun and interesting journey making things that are vegetarian where I don’t miss the meat. It’s also a challenge figuring out what recipes I can cook based upon what they have here at the grocery store. Mexican food (which I love) has been especially challenging as their selection of chilies and spices (Mexican, South American, Spanish etc) is pretty much non-existent. There’s a heavy Asian influence here, but that doesn’t really work for enchiladas or mole! Anyway, I’m babbling here. I made this recipe last night with a package of dried mushrooms I bought at the fruit and veg shop and it was sooooo amazing!! It’s definitely going into my notebook of saved recipes. I can’t wait to try some more of your stuff!! Yum! I made this tonight. So good! My meat eating boyfriend tasted it and liked it. He said next time he would definitely eat it. He’s pretty good about trying things! This one I didn’t even have to ask him to taste. He looked at it said how good it looked and said next time he would eat it. I gave him a mushroom to taste and sealed the deal! So happy you like it Michelle! I made this yesterday, SO good! I didn’t have time to soak my mushrooms for 40 minutes so I threw them in my instant pot for 0 minutes and they were perfect. Made for a really quick lunch. Wow!!! I made this just now—wow! Yummers and the odor I was concerned about is totally not an issue with dried mushrooms. YAAASSS! This recipe is so darn good! 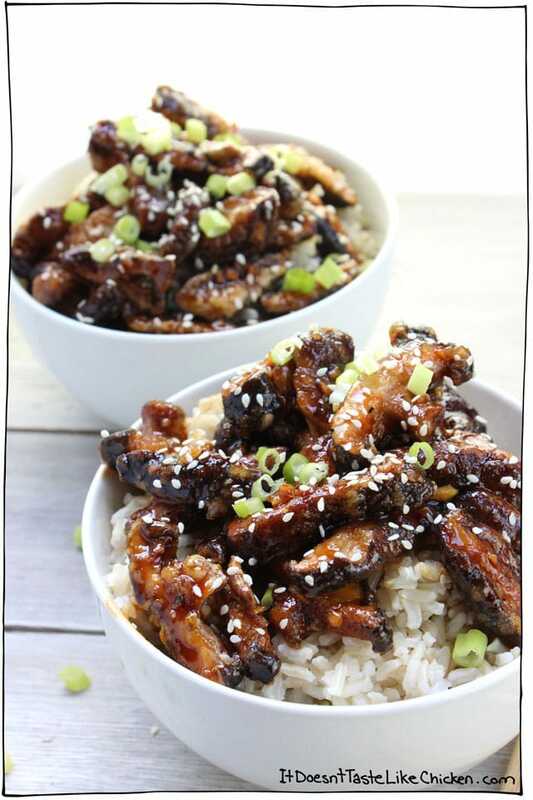 I love how the shiitake mushrooms are crispy on the outside and chewy on the inside and the sauce is complex and tasty. Once you mix the mushrooms into the sauce, the whole dish is gorgeous! I will definitely be including this recipe in my top favorites to be cooked on a regular basis. I wonder what else this sauce can be applied to? It’s so good that I’d love to use it in many other dishes. Also, on a side note, thank you Sam for posting where you purchased your mushrooms from. I ordered the same ones and love them. I always think it’s useful to have such information in case someone like myself wants to mimic your recipe as close as possible or just has no idea where to purchase an ingredient we may be purchasing for the first time. Isn’t it insanely good!? 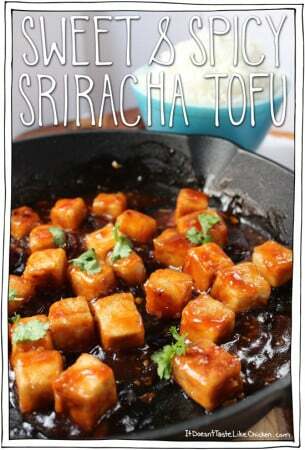 Feel free to fry up some veggies or tofu to toss with the sauce as well. Thanks, Sam! 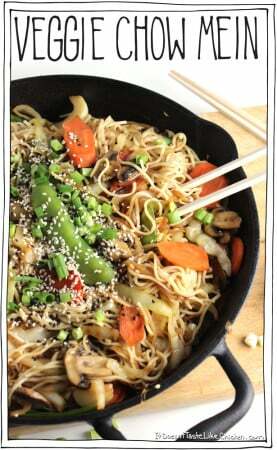 I’m looking forward to experimenting and trying the sauce in a veggie stir-fry. I have never tried it myself, but my research says that tapioca starch might be ok in this recipe. For the vinegar, I don’t think that would be a very good substitute as they have a very different flavour, and rice vinegar is a very common flavour in these Asian inspired sauces. Apple cider vinegar would taste wrong and be too strong. Hope that helps! I made this tonight. My husband was out mowing the grass when we took the first bite. I ran out and begged him to come in and eat. We couldn’t wait until he was finished with the yard. This was incredible. We all LOVED it. After dinner we went online searching websites to order a big bag of Shiitakes. Thanks for all your work in coming up with these awesome recipes. Hmmm…. I do like salt, but it shouldn’t be that salty. Hard to know what happened here without being in the kitchen with you. If you make it again, you can replace the soy sauce with water or vegetable broth. Hope that helps! Somehow I missed this recipe when it first posted but it is PERFECT! I live on a boat and carry dried mushrooms because my fridge is often too small to have fresh mushrooms around…you make hard choices and the space is better used for other fresh veg. Anyway, I am always on the lookout for recipes made specifically for dried mushrooms (they don’t always translate well to fresh mushroom recipes). Thank you!! Can’t wait to try this! And any other recipes you know of that use dried mushrooms would be greatly appreciated. I try searching the internet but I don’t always find dried mishroom recipes! Yay!! That isn’t even something I considered when writing the recipe, but goes to show, you never know who is going to love your recipes and why! Haha. I also use dried mushrooms in my Congee which is a savoury Chinese rice porridge. I think dried mushrooms have a really cool texture, so I am definitely going to keep them in mind for future recipes too. I hope you enjoy the Sesame Shiitake! This was delicious. Once the mushrooms were cooked, I tossed them and an equal amount of lightly-steamed broccoli into the sauce and served it all on rice. I did find that it took a lot more oil than 2 tablespoons — maybe 1/3 cup in all — and the cornstarch smoked the kitchen up pretty good, but it was well worth it. I’ll definitely make it again soon. Another great recipe, Sam! I can hardly wait for your cookbook. My husband made this the other night and it was so good — like, takeout-level good. Yum! Just made your shitake dish. Delicious, except I chopped onions before I realized I didn’t need them!! so sauteed them for a bit. Then I didn’t have fresh ginger, so I used candied ginger and skipped the brown sugar. Still really good. Dang, that looks good! And I have an Asian grocery near me that sells dried mushrooms for cheap. Now I’m wondering if you could mimic clam strips with those bad boys! Can’t wait to give your recipe a try! Thanks Amy! I bet you could mimic clam strips with dried mushrooms for sure 🙂 I hope you like the recipe! I save more of your stuff! This looks great. Haha, awww shucks. Thanks Kathy! I was so excited to see this recipe. I’m new to veganism and have fallen into a pattern of making the same things, which I’m bored with. I live in a rural area so no dried shitakes here. Ordering some today. Thank-you! 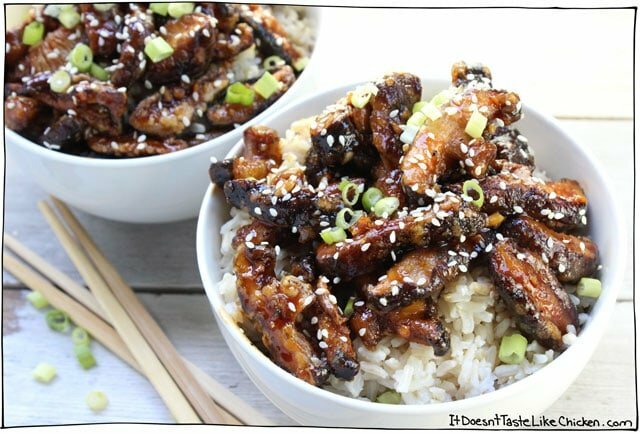 You know, sesame beef is one of those things I didn’t even realize I’d been missing so much until you posted this recipe! I LOVE THIS IDEA. And it looks so simple! Thank you! This recipe looks awesome! And I absolutely love the way you write! I’ve never had someone make me laugh so hard, on a cooking blog. You’re adorable, and a very creative cook to boot! 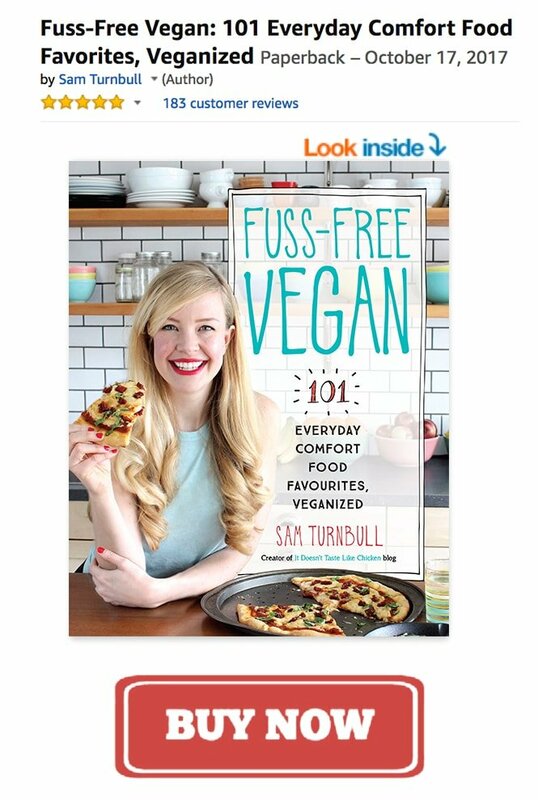 Thanks for all the great recipes, and for keeping us entertained, and saving the animals, too! Bless you, kiddo!